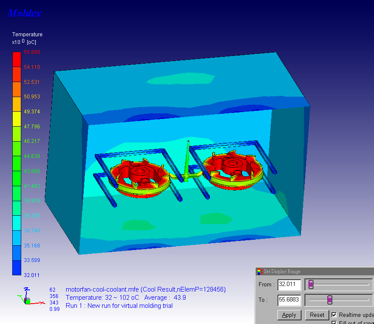 Plastics Simulation | Innova Engineering Inc. Plastics Simulation – Innova Engineering Inc.
Innova Engineering has long standing expertise in plastics simulation, specifically mold flow analysis of thermoplastics. 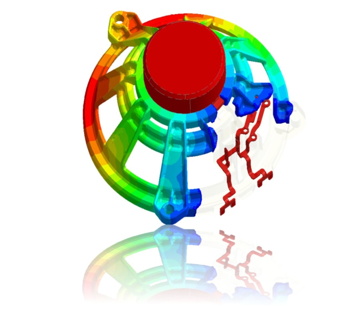 Simulation tools used by Innova range from simple, CAD centric filling and gating studies, to product optimization, highly complex warp predictions, and viscoelasticity load cases. 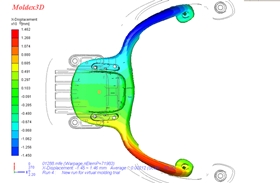 Optimization of the design to anticipate any molding problems before the tool is constructed. 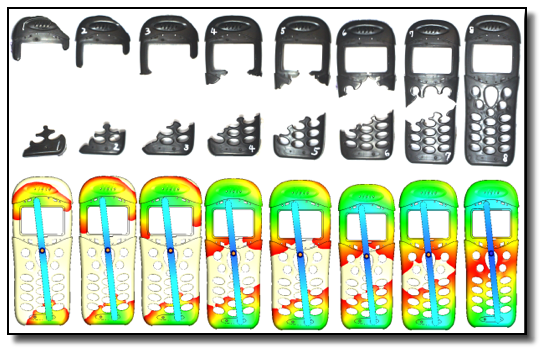 Capture of the “as-molded” structural properties of the part not as designed, but as manufactured, enabling highly accurate FEA of the part. 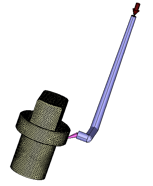 The bottom line-these tools and techniques reduce tool validation times, decrease or eliminate unanticipated part failures, and provide indicators for dimensional stability before releasing the part. 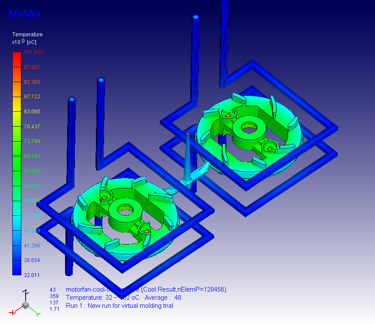 Formally the domain of the tool shop, the value of performing these types of studies as a component of the design and part engineering process is well established. 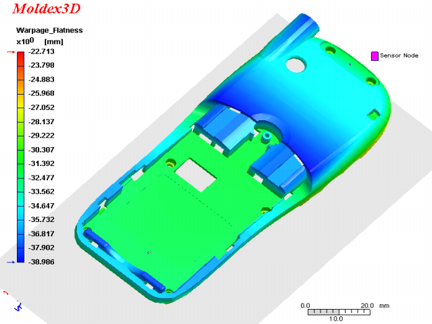 Review the examples below and see how your project can benefit from using advanced mold flow simulation. 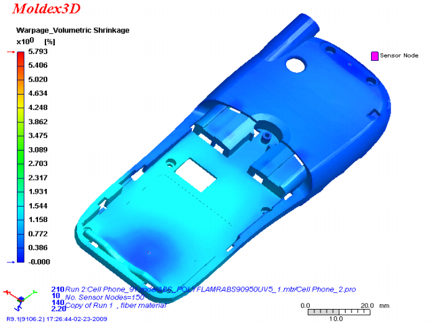 We are able to utilize the exact molding press process parameters to set up our simulation environment. 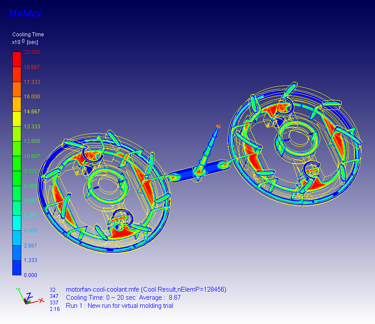 We use the material PVT curves and viscoelasticity properties to accurately determine plastic flow. 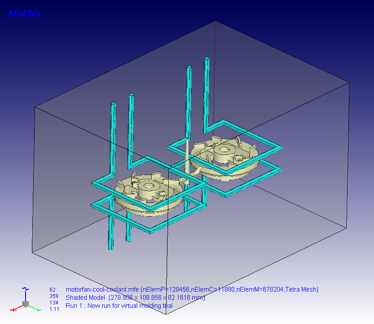 Most mold flow work at Innova is accomplished using fluid elements, as opposed to finite elements, and are processed on an 8 core cluster for high speed, cost effective results. 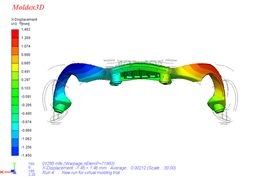 Detailed filling, packing, cooling, and warp studies are developed using full 3D fluid elements for the gate and runner modeling-critical to achieving accurate results. 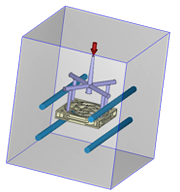 One of the more interesting “tricks” for advanced 3D mold flow analysis, is to utilize a combination of high order hexahedral elements to capture the boundary layer (plastic in contact with the mold surface), with low order tetrahedrals for the remainder, allowing high computational efficiency with extremely accurate results. 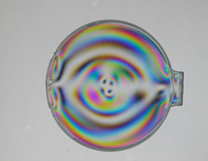 The packing phase of the molding process is unique in that is results in non-Newtonian fluid behavior, e.g., the strain rate variability of fluids is modeled to capture the change in density of the plastic during packing. 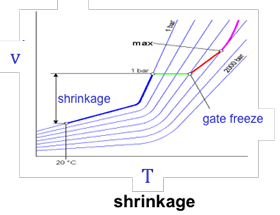 Once the part is successfully filled in the tool, it is necessary to capture the effects of cooling to determine volumetric shrink, and warpage. 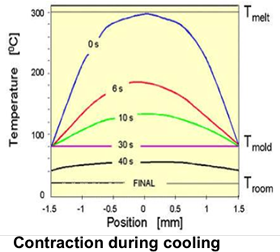 The secret to capturing accurate cooling phenomena is to have a faithful model of the actual mold base, as well as size, location and type of cooling channels. 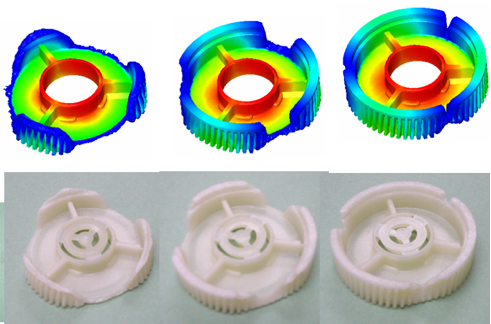 Differences in volumetric shrink and material density variation across the part can and will result in warpage. 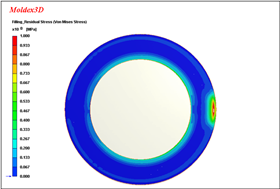 Predicting the location and magnitude of this warpage is very useful at the part design level to gain an understanding if dimensional variation will be problematic during production. 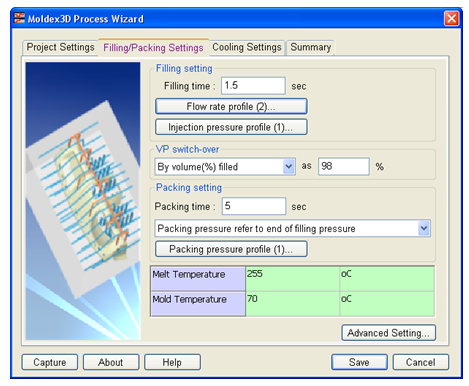 If excessive warpage is predicted, design and process changes can be contemplated as corrective action-before tooling release. 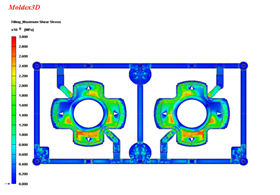 One of the more interesting aspects of mold flow analysis is the ability to export mold flow data into third party FEA solvers. 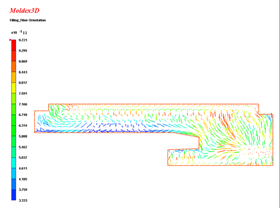 This is a very effective mechanism to analyze the effects of as-molded flow orientation on structural part performance. 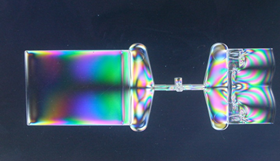 This is especially important with filled materials, such as glass fiber filled, as the flow orientation of the fibers has a very large effect on structural behavior. 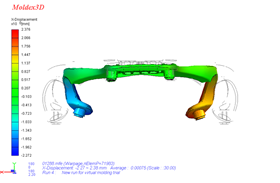 Using the fiber orientation functionality, the following example shows how this can affect the as molded part condition. 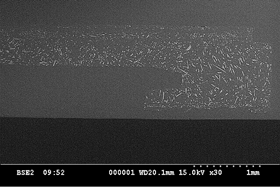 The examples below show the predicted fiber orientation before the part was molded, and the subsequent view is a photographic section showing the actual part after molding. 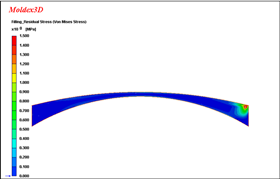 The results show good correlation. 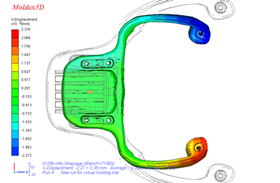 Another useful utility for examining as-molded part behavior is the study of viscoelasticity. 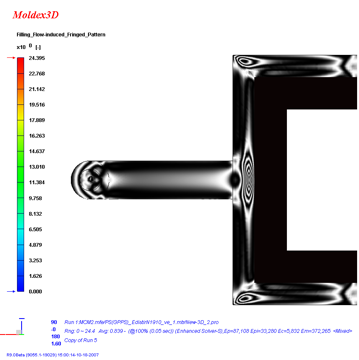 This has many meanings for molded parts, but in general this refers to the residual stress fields that occur as a result of the injection molding of a given part. 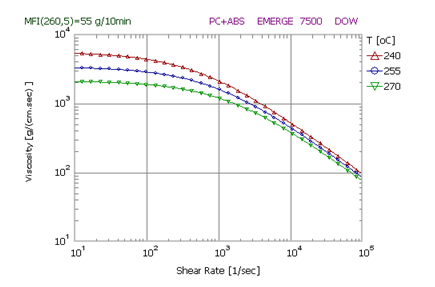 The combination of thermally induced stress, with the flow induced stress of the filling process leaves us with some residual stress values after the part is ejected from the tool. 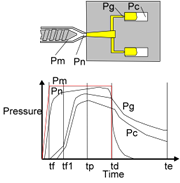 These stress fields can cause distortion, time dependent dimensional shift, and weak areas in the part-all of which can be predicted before releasing the part for tooling. 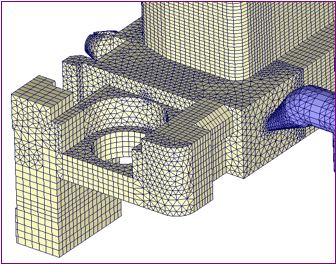 In addition, these properties can also be exported to third party FEA solvers for structural analysis- a very useful capability.